Daimler will pay €640m to acquire a minority stake in the car division of Beijing Automotive, its Chinese joint venture partner, as it seeks to catch up with BMW and Audi in China’s fast-growing premium car market. The Stuttgart-based car and truckmaker has agreed to acquire 12 per cent of BAIC Motor, China’s fifth-largest domestic carmaker by sales, ahead of BAIC’s initial public offering this year. Daimler, which will take two seats on BAIC’s board, said it will be the first western carmaker to own a direct equity stake in a Chinese car company. Meanwhile, Daimler will cede to BAIC the control of its local production joint-venture that makes two Mercedes-Benz saloons and a sports-utility vehicle. This will allow BAIC to consolidate those operations ahead of its IPO. In return the German company will take a controlling 51 per cent stake in their sales joint venture. 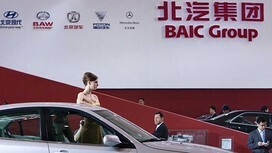 Xu Heyi, BAIC chairman, said the deal would help Mercedes-Benz boost its business performance in China. Bodo Uebber, Daimler chief financial officer, said the stake purchase would help Daimler “be part of the growth of one of [China’s] major domestic participants”. Last year Mercedes-Benz overhauled its Chinese sales organisation and appointed Hubertus Troska to a newly created board position with responsibility for China after its sales there lagged well behind Volkswagen-owned Audi and BMW. Mercedes-Benz sales in China increased 1.5 per cent last year compared to an increase of 30 per cent at Audi and 40 per cent at BMW. Daimler’s investment in BAIC will occur through the issuance of new shares. The deal is expected to close around the end of this year. Daimler also has a Chinese truck joint venture with Foton Motor, a van joint venture called Fujian Benz, and an electric car joint venture with BYD. Meanwhile, BAIC has a separate car production joint venture with Hyundai. Manganese Bronze, maker of London “black cabs” for more than six decades, has been sold to Geely, adding another well known European brand to the private Chinese carmaker that already owns Volvo. Geely, which already owned 20 per cent of the black cab maker, bought Manganese Bronze for only £11m after it went into administration last October. The Chinese company, which was Manganese Bronze’s largest creditor, said it would continue to assemble the company’s TX4 model at the Manganese Bronze plant in Coventry. The acquisition came after Geely refused to provide funding to keep Manganese Bronze afloat. Daniel Li, the chairman of Geely UK, said the Chinese company planned to use the Manganese Bronze operation as a base to sell Geely cars into the European market. He said the purchase would give the Chinese company “a solid foundation, not only for its location but also the dealer network”. Mr Li said the Coventry plant, which employs 107 people, “could get even bigger”. He indicated that Geely expects to invest £30m-£50m in the Coventry plant over the next 5 years to bring new models into production. Peter Johansen, group finance officer of Manganese Bronze who becomes executive vice-president of Geely UK, said cab production, which has been suspended since October, would resume “in the next few weeks”. The company last made a profit in 2007. But Mr Johansen predicted a return to profitability “within three years and quite possibly two” if the UK economy picks up. The company hopes to bring its new TXN vehicle – a smaller private hire taxi for the UK and global markets – into production by 2017. David Bailey, automotive expert at Coventry University, described the acquisition as “probably the best-case scenario in terms of rescuing the firm and saving remaining jobs in Coventry”. The London cab takes its place alongside Weetabix, the famous British breakfast cereal, in the list of has-been brands that could get a new lease of life under Chinese ownership. “We are determined to restore the fortunes of this totemic marque which is known, recognised and admired all around the world,” said Li Shufu, chairman and founder of Geely. “Geely’s priority will be to re-establish the manufacture, sale and servicing of new and current vehicles on broadly the same basis as existed before the business went into administration,” the Chinese company said in a statement. The deal was agreed with PwC, the administrators of the British business. Geely is still struggling to digest its 2010 acquisition of Volvo, the famous Swedish marque. Volvo sales in China have so far been disappointing: in the 11 months to the end of November last year it sold just 37,633 cars in China, 9 per cent fewer than in the previous year, at a time when other luxury carmakers in China were recording double-digit growth.